I’ve got a lot of brothers-in-law. I have two sisters, both married, so that gives me two. My wife has two brothers, too, so that brings me up to four. My wife also has three sisters, all of whom are married, for a grand total of seven brothers-in-law. One of my sisters is married to an actuary/carpenter. For that matter, Trish has a brother who’s a carpenter, too, but then he’s also a delivery driver and a police officer. Among them, they’ve got quite a diversity of interests, skills, and backgrounds. Last December we were in Wichita for Christmas with Trish’s (huge) family, and I ended up sitting a back corner next to another of these brothers-in-law. He and I struck up a conversation to pass the time while a little army of kids opened bright, noisy presents. My writing (and publishing) have become big talk within Trish’s family, so naturally our conversation turned there. He asked me how things were going, and I told him about the adventure of publishing Gods Tomorrow and the exciting plans for an upcoming photoshoot of Expectation and the challenge of staging some of these cover shoots. The trickiest part for the Ghost Targets covers is Katie’s costume. She’s an FBI agent. These are cop mysteries, and I need to show that on the cover. So we’ve always got her wearing (or wielding) her trusty sidearm. Would you believe he was a warden? I had no idea. Life can throw you some funny surprises from time to time. So we talked some strategy after that, trying to figure something out, and we really came up blank. In the end, it didn’t matter too much. I talked through a couple exciting scenes from the story with my cover artists, and we came up with a great alternative that only required us to take a firearm to an abandoned parking garage. And that, I must say, turned out amazing. 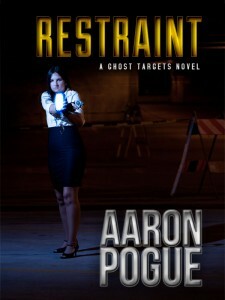 Incidentally, Restraint is now available from Consortium Books. Take a gander at that gorgeous cover, check out the story description, and consider sharing a few bucks to support a really great group of artists. Thanks! This was written by Aaron Pogue. Posted on Tuesday, August 16, 2011, at 6:50 am. Filed under For Fun. Tagged Consortium Books, Ghost Targets: Expectation, Ghost Targets: Restraint, Gods Tomorrow, Platform and Promotion, Publication, Trish Pogue. Bookmark the permalink. Follow comments here with the RSS feed. Both comments and trackbacks are currently closed.